Dance floors are another part of the Event Dynamics occasion package and can become the focal point of your event. 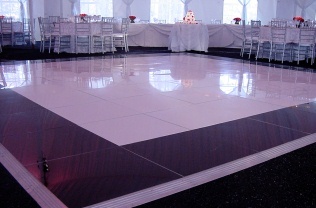 Guests can dance the night away on glistening white, elegant black, or classic black and white checker boarded pattern dance floors. You may decide to design your own custom dance floor pattern! Event Dynamics will create a dance floor that fits the décor of your special occasion. Check out more examples in our portfolio!